Twelfth-century floor tiles with decoration in high relief are known from sites in England, the Alsace region of France, Denmark and the Czech Republic. 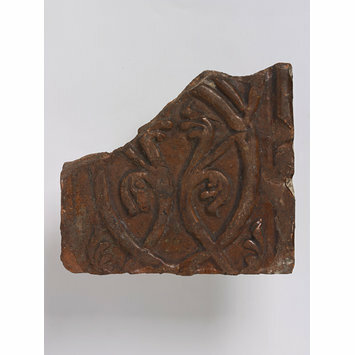 Among the earliest is a group of tiles from the chapter house of St Albans Abbey, dating from about 1160. The floor was laid out in a series of panels edged with border tiles like this example. This layout perhaps guided processional movement around the building. Tile fragment of red earthenware with decoration of interlacing stems and frond-like foliage in relief; the whole covered with a yellowish clear glaze. From the Chapter House, St Albans Abbey. See also the tiles found at Hertford Priory and Wymondham Priory, both of whom were dependents of St Alban's. 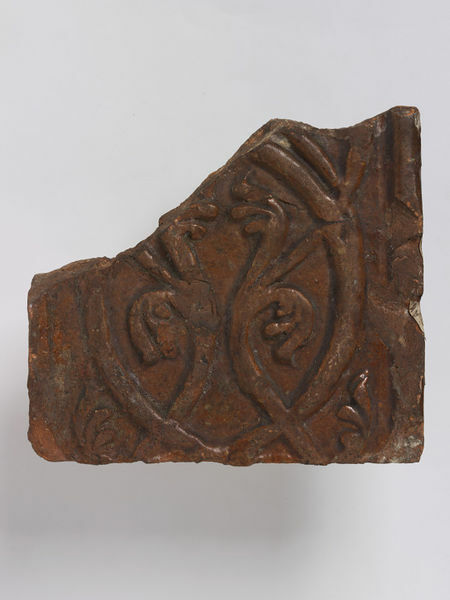 Tile fragment of red earthenware with decoration of interlacing stems and frond-like foliage in relief; the whole covered with a yellowish clear glaze. From St. Alban's Abbey, Hertfordshire. English, about 1160. Graves, Alun. Tiles and Tilework of Europe. London: Victoria and Albert Museum, 2002, fig 1.2, p9. From the Chapter House of St Alban's Abbey in Hertfordshire.